The kitchen units and doors arrived last Thursday and Dom took Friday off so he'd have a long weekend to start installing them. It was a slow weekend, because of the plumbing for the dishwasher, which involved some intricate copper pipe-work. We had to pre-empt delivery of the appliances and go and pick up the dishwasher from the shop we'd ordered them from to find out how much space there'd be between the back of the dishwasher and the wall. It turned out there was none, so the wall had to be cut out and the pipework inset. This took up the whole weekend. Meanwhile, I gave our downstairs ceiling it's final coat of white paint. It was a neck-breaking job which took 6 hours, but it looks fantastic. After buying some more paint samples, I was relieved to find exactly the kind of colour I have been looking for - sort of light stone, without a yellow tinge. OK. It might look like grey, but it's still a warm colour. It will go with my aubergine light fitting, and the monotone kitchen, and because it doesn't have a yellow tinge, it doesn't clash with the wooden floor. We've mixed up 10 litres, so I know what my job will be this weekend! We have chosen our floor. Laminate by Quick-Step. I love it. Not too dark, not too light. Great quality. 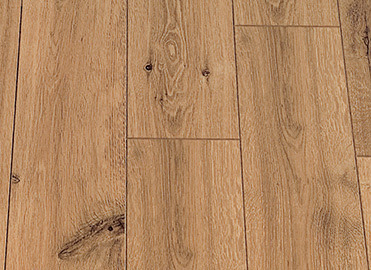 We've gone for Vintage Oak Natural Varnished Planks with 'Perspective 4' which means it has a 'v' cut on each edge, to give a profiled look rather than smooth laminate. The salesman at Allied Carpets was kind enough to let us take some large samples home to lay out on the floor. It's going to be difficult telling him that we're going for an online retailer who can undercut them by £5 per square metre, but I'm sure we'll get over it. The narrator is Richard Burton and the words are from Under Milk Wood by Dylan Thomas. I've just been to this site and read the whole play. You can listen to it on that website too, read by Dylan Thomas, whose deep Welsh voice is just as soothing as Richard Burton. I love it! I think it's one of the most well written pieces of prose I've ever read! The background info is interesting too. Must discover more Dylan Thomas stuff. Got back from the festival yesterday and it was wicked! We saw The Feeling, Snow Patrol, Amy Winehouse, Paulo Nutini, Keane, Donovan, The Fratellis, Muse, Kasabian and The Rolling Stones! Highlights for me were The Feeling, Snow Patrol and The Stones. I can't believe how much energy Mick Jagger puts into his performance - more than I've ever seen any young person do. When the stage started to move and the whole band came into the crowd for Satisfaction everyone went wild and we got so close! The weather was extremely hot, so we all got sunburnt and it meant no lie-ins in the baking hot tents, but we can't complain! Our walls are currently a patchwork of sample paint colours from Dulux. Clockwise from top left: Chalk Blush 4; Chalk Blush 3, Dusted Moss 4, Dusted Moss 3, Khaki Mists 5, Khaki Mists 6. Our favourite out of these is Khaki Mists 6, but I think I might need more samples to make the final decision. No rush. Kitchen units being delivered next week, appliances on order, collecting quotes from granite worktop suppliers but nearly there.